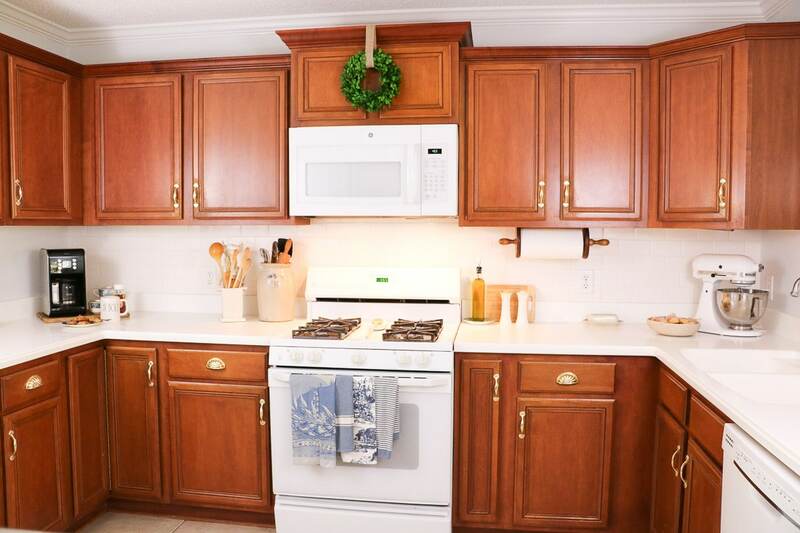 Farmhouse kitchen decor is trending this year. 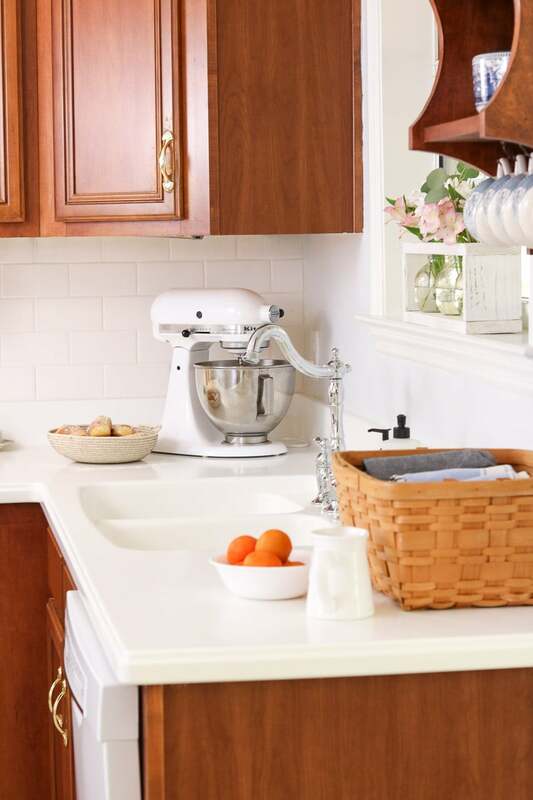 Tour our kitchen for tips and ideas for that warm country feeling with some old and new decor plus a whole lot of love. Welcome to our kitchen here at Summerhill. It has gone through a few changes lately. All the fruity wallpaper is now gone, and we have added some new and old accessories to jazz it up. I hope you enjoy touring our kitchen and get some inspiration to do some farmhouse decorating on yours. We have lived in our home since 1999. During those years our kitchen has transformed many times, but the last transformation is probably the biggest. You see we had a very happy bright fruit wallpaper. I loved it!!! But it was time to move on and what was calling me this time was a modern French farmhouse look. But what does someone do when they have a limited budget. Well, paint and accessorize. To begin, I am going just to give you an overall view–the big picture. Here is how the kitchen all looks together. Paint is the cheapest and most significant transformation you can make to a room. It is usually the last thing I recommend you pick out when you are planning your design, but in this case, I knew I didn’t want any patterns, just color, so I started with paint. So, go for it and pick a color. I have a foolproof way to select the perfect color in my HOW TO SELECT POPULAR ‘FIXER UPPER’ PAINT COLORS. 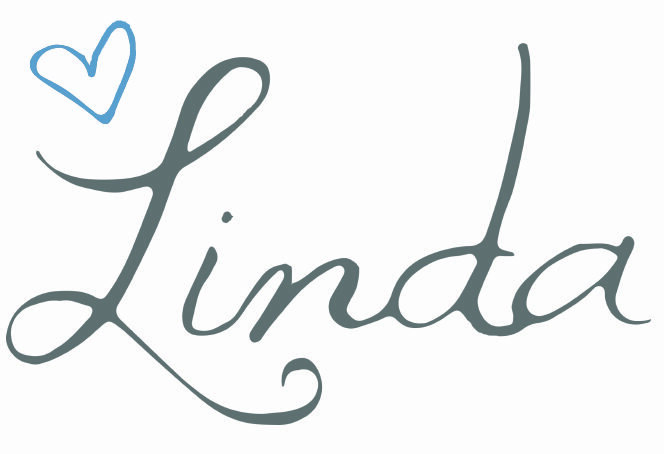 Let me encourage you to go to Etsy or a local store or even an event where people make beautiful accessories. I love this “Welcome” sign from The Wooden Butterfly. It invites people into my kitchen and has that warm “welcome” feeling. 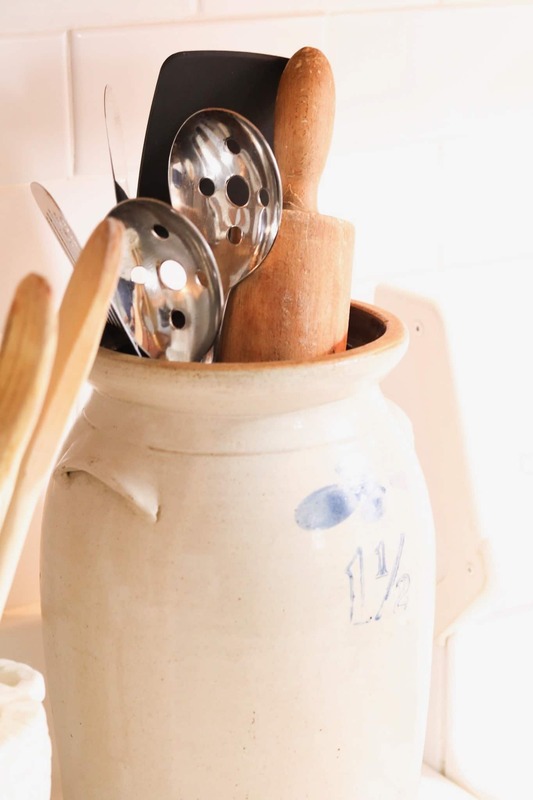 An authentic farmhouse feeling isn’t complete without something old and what doesn’t say kitchen like a pickling crock. This old crock was the perfect piece to hold our cooking utensils, and I love how it fits with my rabbit wooden spoon holder. But that isn’t the only thing old in our kitchen. If you have been on my site very long, you know all about my grandmas Currier & Ives dishes. 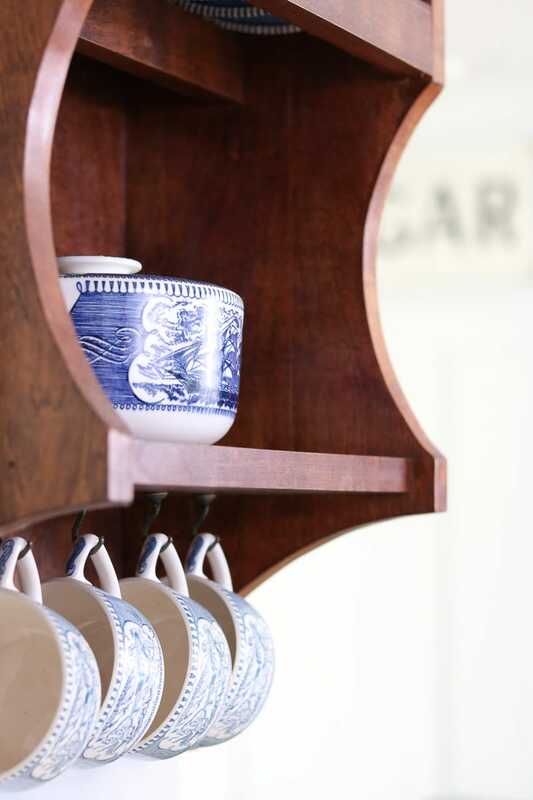 Displaying your vintage plates has farmhouse written all over it. 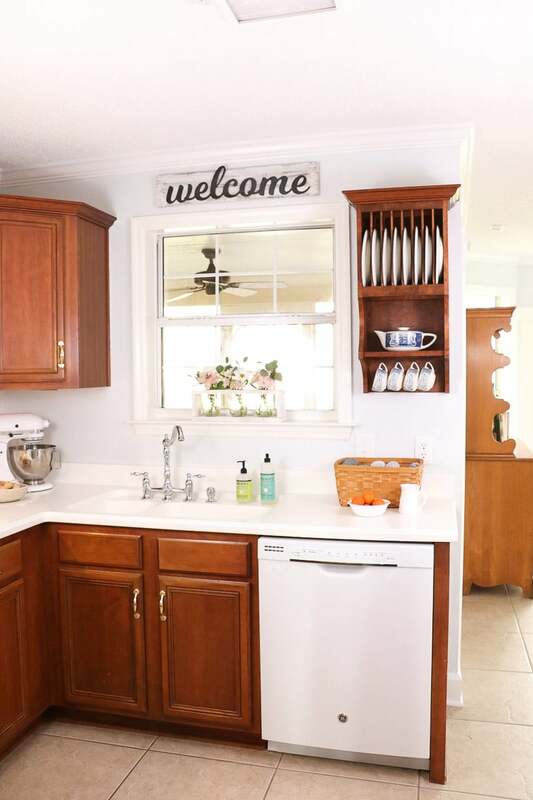 Okay, well this is not something I think is mandatory to pull off that farmhouse kitchen decor look but it sure is popular right now. Rae Dunn gives that handcrafted, fun, warm feeling to any space. 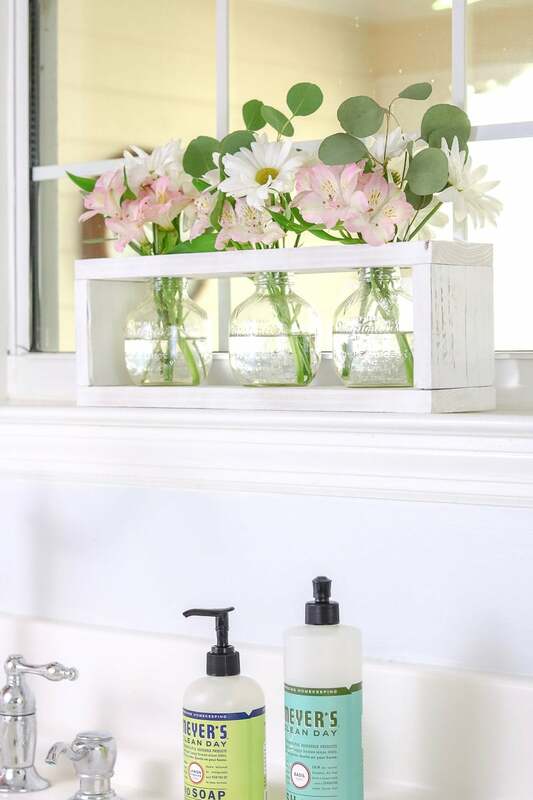 So, consider adding coffee cups, sugar dish or anything Rae Dunn to accent your farmhouse look. 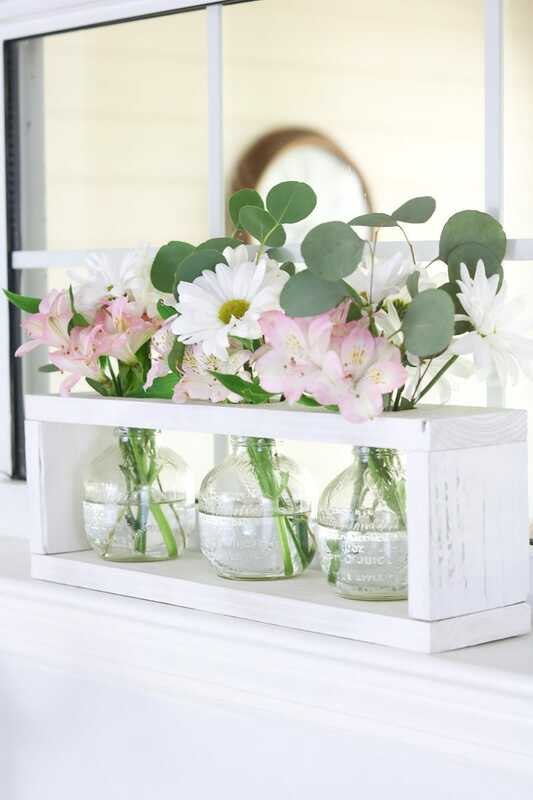 Every kitchen should have a place for flowers, and a window sill is a perfect spot for flowers. I adore these jars that are nestled in by some painted reclaimed wood. A friend brought me this after my sister passed and it holds a sweet place in my heart. Keeping some flowers here adds some life to my accessories. So, consider adding some life to your kitchen accessories. 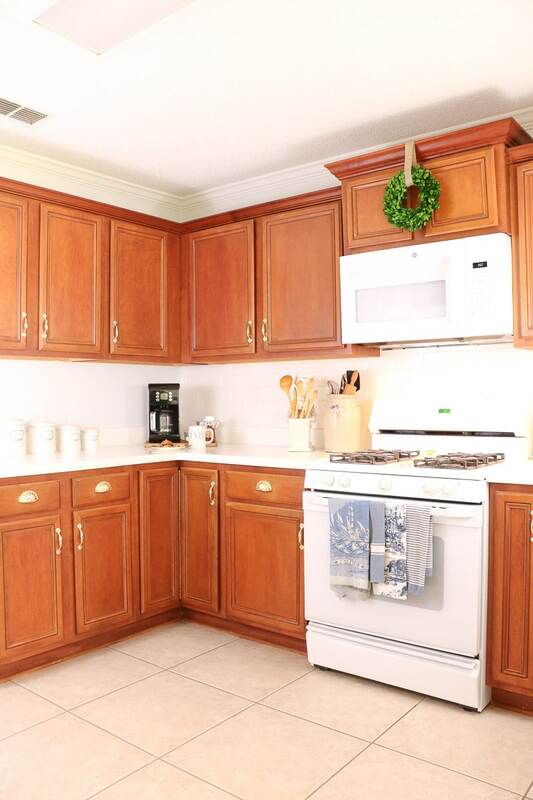 You know those cabinets over your stove that is so hard to reach and hardly ever get opened. Well, why not add a little love there. 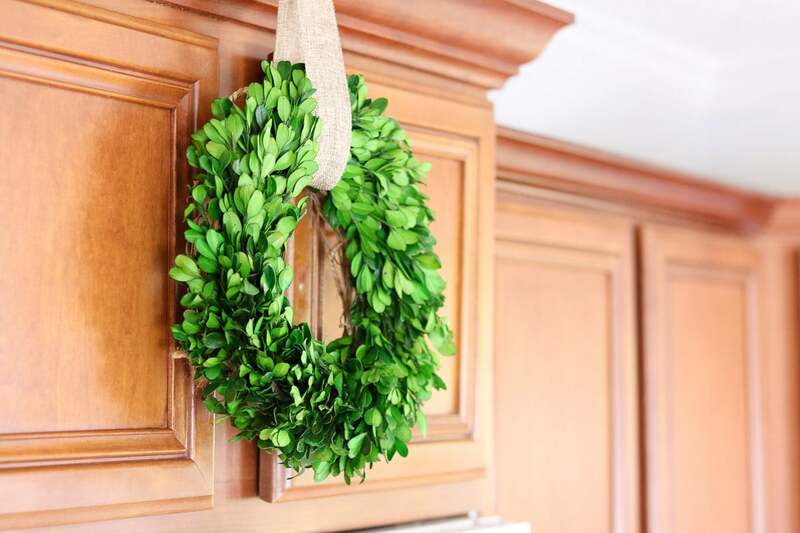 I removed my knobs and added this small boxwood wreath. It gave this space more focus and the little details will make your design. Now here is a secret I am about to spill. I have a weakness for farmhouse french style dish towels. So when you have so many lovely towels why not put them out on the counter for easy access and as another accessory. 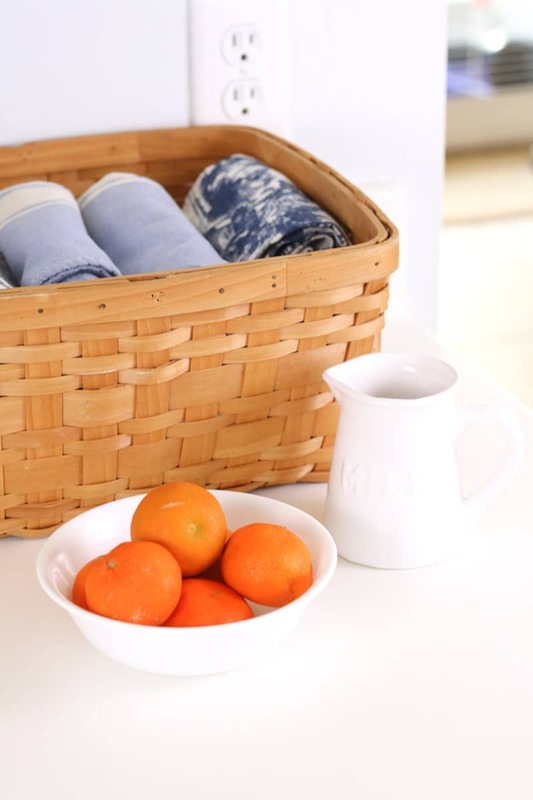 Having a basket out on your counter adds a nice texture to your space, and you can fill it with fruit, utensils or like me beautiful dish towels. See how simple and fun it is to create a farmhouse style kitchen? 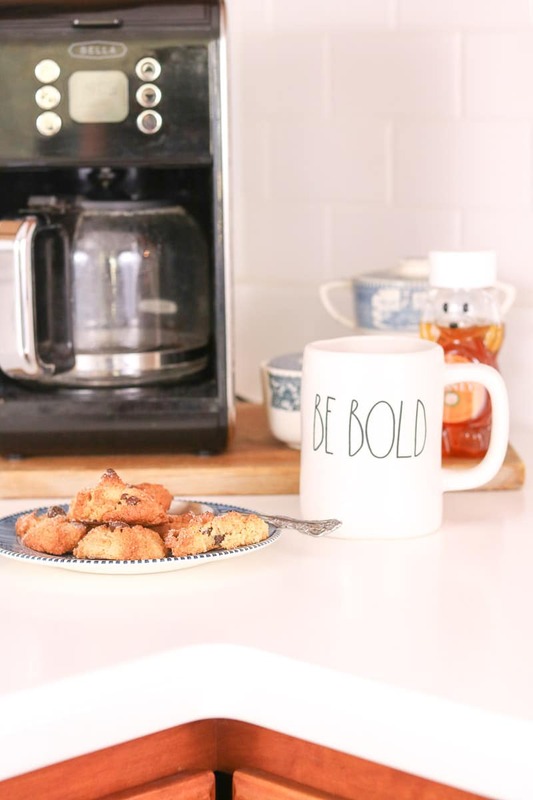 I hope this post has equipped you with the courage to decorate your kitchen too. I love that Rae Dunn coffee mug. I will definitely be getting one of those!! 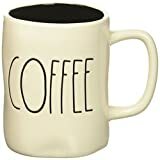 You will love this mug! Rae Dunn pottery is so much fun! 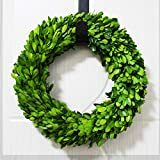 Amazing kitchen decor tips!! Loved the way you have explained them with pictures! Helpful indeed. Thanks for sharing!! Thank you! I am so glad you enjoyed it!